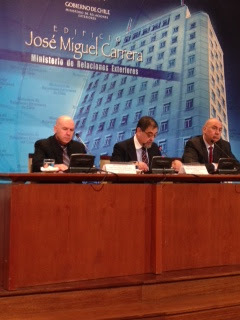 On 25 August 2014 the Global Centre and the Ministry of Foreign Affairs of the Republic of Chile co-hosted a training seminar in Santiago, Chile. The seminar was opened by the Deputy Minister of Foreign Affairs, H.E. Edgardo Riveros Marín. Topics of the seminar included sessions on the development of R2P and its institutionalization at the UN and on the current "state of play" of R2P in light of the ongoing crises in Syria and elsewhere. The sessions also addressed Chile's strong support for R2P and the country's role in the implementation of the emerging global norm, especially in light of its current membership of the UN Security Council. The Global Centre's Executive Director, Dr. Simon Adams, and former-Director of Policy and Advocacy, Ms. Naomi Kikoler, participated in the seminar.